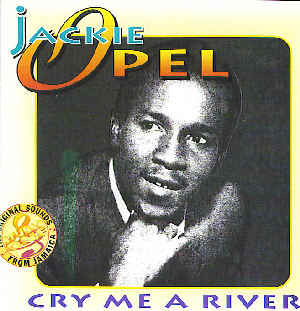 Cry Me A River by Jackie Opel,(born Dalton Bishop) is a classic album of soul music originating from the Caribbean. Jackie was one of the most popular entertainers in Jamaica and the Caribbean during his time. Born in Barbados, Jackie rose to prominence after performing in Jamaica and recording his renditions of soul music within the SKA beat,during the SKA era.. "Cry Me A River", remained the number one song on the charts in the Caribbean for a long time. This album portrays in sharp relief,Jackie's varied capabilities as a singer. His interpretative phrasing,lyric reading and his inimitable diction are cognent indices of Jackie Opel's genius. The soulful,Jackie Opel later became a catalyst for "Ska", "Spouge" and "Rocksteady" that evolved into "Reggae".